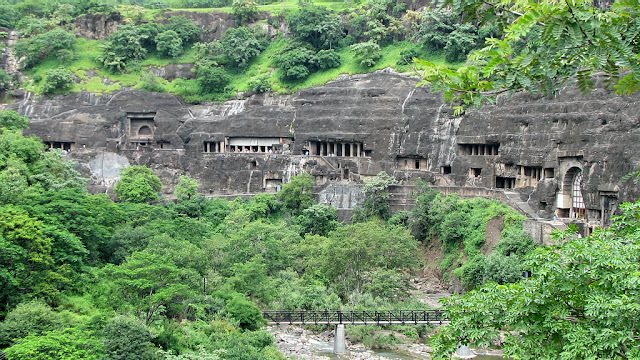 When I decided to make a trip to Mumbai to meet my aunt Hema, the senior most living member of my family, before entering the eightieth year of earthly existence in this body and take her blessings personally, I planned to combine it with a visit to the cave temples of Ajanta and Ellora. Fortunately there was a weekly express train to Aurangabad running from Chennai on Sundays. Boarding this train on 15th November, I reached Aurangabad on Monday the 16th in the morning. 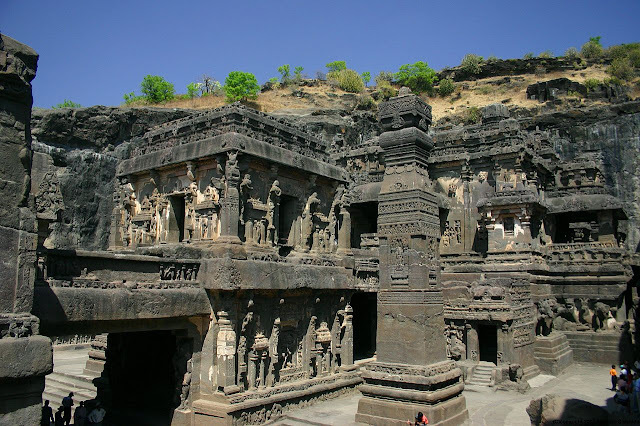 After freshening up in Hotel Pritam, where we stayed for two days we made our way to Ellora caves in the afternoon. Near the Ellora caves is Ghrishneswar temple, which has one of the twelve Jyotirlingas. From there we went to nearby Khuldabad where we visited Bhadra Maruti temple and tomb of Aurangazeb. Aurangazeb’s tomb is a simple one, as he had left instructions that his resting place should be built only with the money earned by him by stitching cloth caps and that it must be covered simply with earth. In Bhadra Maruthi temple which is dedicated to Hanumanji, the imposing idol is seen in a rare posture of lying on its back, as if sleeping. By then darkness had set in and we retired to the hotel in Aurangabad. That evening we visited Bibi ka Maqbara, also called “Mini Taj”, which is a tomb built by Aurangazeb for his wife Rabia Durani, modelling it after Taj Mahal. It is a pity that there were not enough lights there after sunset. The next morning we vacated the hotel and started our journey to Shirdi. On the way we first visited a local attraction, Panchakki, a water-mill from Mughal times situated in a garden attached to the tomb of a Muslim saint, Baba Shah Muzaffar. After visiting Panchakki, we made our way to Daulatabad fort. The fort has an interesting history. It was originally called Devagiri, built by a Hindu King. Later it fell into the hands of Muslim rulers. 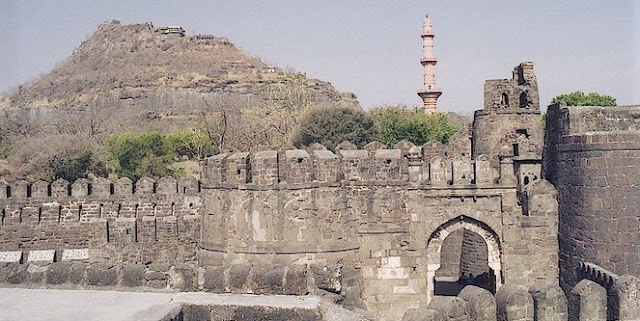 Muhammed bin Tugluk renamed it as Daulatabad and made it his capital, ordering all the inhabitants of Delhi, young, old and sick to march to Daulatabad. After a brief period of reign from here he changed his mind and ordered a march back to Delhi. Both these transplantations of population caused huge loss of lives and suffering. We stopped again at Sani Singanapur where there is a famous temple dedicated to Lord Saneeswara. There is no regular temple or a priest to perform daily pujas. The idol is on a raised platform in the open ground and male devotees in wet clothes after bath can ascend the platform and perform puja and abhishekam. Others can stand below and have Darshan. Another unique feature is the houses in the village have no doors as Lord Saneeswara is supposed to guard them. Nowadays a few have a screen for privacy. Not only the old houses but even the modern constructions like toilets in the premises have no doors which Rajam found quite embarrassing to use. We had a sumptuous lunch here in the Devasthanam hall which was provided at a subsidised rate of Rs.20/- per head. We reached Shirdi in the evening and rested in Hotel Yog Palace where we had booked a room through Booking.com. That evening we had Darshan at Samadhi Mandir making our way there through the special entrance for seniors. The next morning we went to Nasik where we visited first Mukthidham, a beautiful temple in white marble where idols of all deities find a place. From there we went to Panchavati where we entered sliding, Sita Gumpha, a small underground cave where Sita Devi lived in Vanvaas. and crawled with difficulty to the end of passage. From there we went to Ram Kund and Lakshmi Ghat of Triveni Sangamam where rivers Varuni and Tharuni unite with River Godavari. We wetted our feet at the place used by Lord Ram for bath during vanvaas and splashed the sacred river water on the head and left for next destination, Trimbakeswar temple that is about 28 kilometres from Nasik.